For over a hundred years, Hart’s Rules has been the authority on style, helping writers and editors prepare copy for publication. The latest edition of this guide has been updated for the twenty-first century using the resources of Oxford Dictionaries and with the advice of publishing experts. Twenty-one chapters give information on all aspects of writing and of preparing copy for publication, whether in print or electronically. I often use New Hart’s as a source for blog posts and for information that I give to clients. It’s compact but thorough and detailed. It’s easy to find the information you need and helpful examples are given. It may not directly address all possible scenarios (something The Chicago Manual of Style seems to have attempted) but the style guidance is easily applied in most circumstances. Of course, it is important to point out that New Hart’s is a style guide and ‘correct’ style is often subjective. For example, Oxford style prefers -ize spellings for verbs but other styles may not agree. However, New Hart’s generally acknowledges areas where some style guides may give different advice. When I started out as a proofreader, I found the chapters on how to style work titles, quotations and direct speech, and numbers and dates particularly helpful (as evidenced by the multitude of sticky notes all over my well-thumbed first copy). I think self-publishers would find it helpful as a guide to standards that would be acceptable in traditional British publishing and how to attain those standards in their own work. The most recent edition of New Hart’s was (at the time of writing) released in 2014. The 2005 edition is, as far as I am aware, still perfectly serviceable, but the 2014 edition is updated and contains an extra chapter (on the differences between US and British English). It’s available in most bookshops and through online retailers, including Wordery and Amazon. You can also access it online for free if your library card gives you access to Oxford University Press resources – you can read more about that here. If you have a copy or use the online version, please let me know what you think of it! I was given a copy of Damp Squid: the English language laid bare for Christmas. I’d like to say one of my best friends knows me so well that this was a gift he picked himself, but I asked for the book and he called me a nerd when he gave it to me. How many words are there in the English language and where were they born? Why does spelling ‘wobble’ and why do meanings change? How do words behave towards each other – and how do we behave towards words? And what does this all mean for dictionary-making in the 21st century? This entertaining book has the up-to-date and authoritative answers to all the key questions about our language. Jeremy Butterfield edited the recent edition of Fowler’s Dictionary of Modern English Usage and I have shared some of his articles on Twitter. I admire his work; I think he is an eminently sensible man. Damp Squid is aimed at a British audience but I am sure an American reader would understand most of the references (or at least understand them enough in context). I think it is fair to describe the book as a love letter to the Oxford Corpus. The corpus is made up of global English texts, of all types, that can be read electronically. From this, researchers can draw conclusions about how the English language is being used. Butterfield uses the corpus to explore the evolution and usage of English. He focuses on how the language is used rather than on prescribed ideas of how it should be used. If you have read some of my previous posts, you are probably aware that I usually write about standard usage rather than ‘correct’ usage. The book gives a good overview of how standard is determined and the problems that arise from trying to present one ‘correct’ version of English. You might think that a book taking a close look at spelling and grammar would be dry and a bit dull. On the whole, Damp Squid is entertaining and interesting. Butterfield is mostly successful in balancing depth of information with amusing examples (“spam rage – the incandescent anger caused by dozens of emails offering to enhance parts of your anatomy you were perfectly happy with”). The discussion is accompanied by explanatory tables of usage statistics and illuminating quotes from such figures as Samuel Johnson. All the chapters are clearly written and accessible. You don’t have to be a language expert to enjoy the book but an interest in the English language is probably required. Two of my favourite chapters are those on where words come from and words that often group together. You might recognise the eggcorn in the title: damp squid. It appears in the chapter discussing idiomatic phrases, and the chapter is fascinating (especially the section comparing idioms from different languages). I read Damp Squid in a few enjoyable hours (it is 165 pages excluding notes and index). You can find more reviews on Amazon, and you can probably acquire a second-hand copy for a reasonable amount if you fancy adding it to your bookshelf. Or you could start your Christmas list early. The Penguin Writer’s Manual is the essential companion for anyone who wants to master the art of writing good English. Whether you’re composing an essay, sending a business letter or an email to a colleague, or firing off an angry letter to a newspaper, this guide will help you to brush up you communication skills and write correct and confident English. via The Penguin Writer’s Manual. The book isn’t as belligerent as that passage makes it sound. The value of this book is probably not in the depth of its explanations. If you need a quick refresher on what an adverbial phrase or a preposition is, this will help. The sections on word usage and vocabulary are also useful. If you need to write a business letter but you aren’t sure what to include, the guidelines are well explained with examples of good practice. Other types of communication you may not do on a daily basis are also addressed, such as letters of sympathy or job references. One of the wisest uses of time is to think about precisely what it is you wish or need to say. The book has 352 pages and would be easy to tuck into your bag if you wanted to work outside. You can find the book and more reviews on Amazon, but you can probably pick up a second-hand copy for a very reasonable amount. Punctuation..? 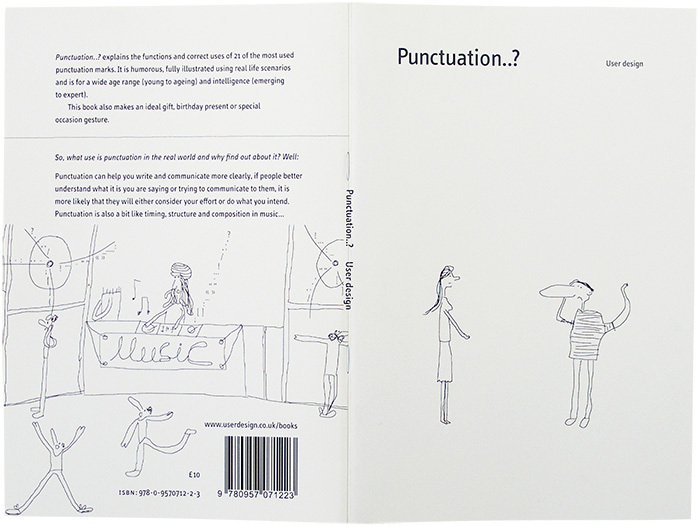 aims to explain the functions and uses of 21 punctuation marks. The intended audience seems to be broad, but the content is focused on the British English use of punctuation. It is a slim book at 36 pages. It is staple bound (or saddle stitched) with the title of the book on the spine. Image used with permission from User Design. Printed on good quality paper, it feels nice in the hand. However, I don’t think this can help to justify the £10 price tag. 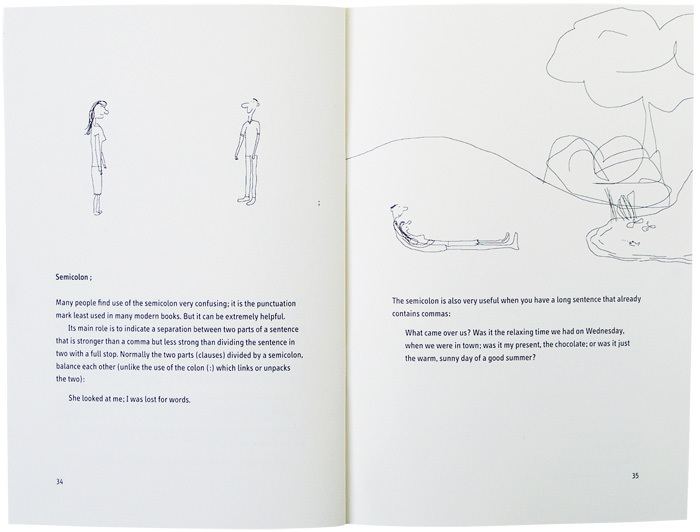 The illustrations are idiosyncratic but charming. They are the main selling point of this publication. Readers who are easily bored should find the often amusing drawings enough reason to keep reading. I was very pleased to see en dashes and em dashes touched on as well as hyphens. I was also interested to see guillemets, interpuncts and pilcrows included. Unfortunately, the book is let down by errors, clunky prose and a lack of clarity. I find some of the explanations to be unhelpful or slightly misleading. This is a shame because Punctuation..? could be an excellent introductory guide after a little polishing. The book is ideal if you want to spark someone’s interest in punctuation. It would also be ideal for a child who finds the topic of punctuation difficult or intimidating. For adults, you might enjoy it as a quirky primer. But if you want to know how to use punctuation correctly, I can’t recommend anything more than Trask’s Guide to Punctuation. This is my latest book recommendation. I consult this book regularly and it rarely lets me down. Respected and authoritative, it is a book with a sensible and measured approach to the English language. The 7,500 entries are displayed in an A–Z fashion (like a dictionary, as per its name) with clear explanations and examples. It covers grammar, syntax, spelling, word choices and meanings, punctuation, and differences in English usage around the world. Fowler’s is my favourite source for identifying myths and ‘rules’ that are unnecessary and that damage good writing. I referred to it in my previous post on ending a sentence with a preposition, and I have directed clients to it when discussing preferred forms of words. I even flick through it occasionally just to see what interesting entries I stumble across. My hardback copy of the latest edition has 928 pages – you probably won’t want to carry it around with you! But it is an excellent publication to add to your collection. And (to my chagrin) it seems to be a lot cheaper to buy now than it was when I bought it. If you struggle with punctuation, this is the book that you should acquire a copy of. I have many, many books that I refer to when I am working. The Penguin Guide to Punctuation by R. L. Trask is probably the most accessible one on the subject of punctuation. The definitions, explanations and examples are simple and easy to understand. The text is well laid out and not an overwhelming block. At 162 pages it isn’t an intimidating tome and you can take it with you to wherever you like to write. It is incredibly thorough (especially the chapter on commas) and even deals with aspects that are not strictly punctuation (such as capitalisation). I recommend this book because no one should be afraid of punctuation. Sometimes it gets tricky, but most of the time it is fairly straightforward. I know that people worry about their use of commas or what a semicolon is actually for. But once you have the knowledge how, you will be surprised at your ability to wield them effectively in your writing. The guidelines are expertly set out in this book, and they will give you the confidence you need to be able to use punctuation at its best.